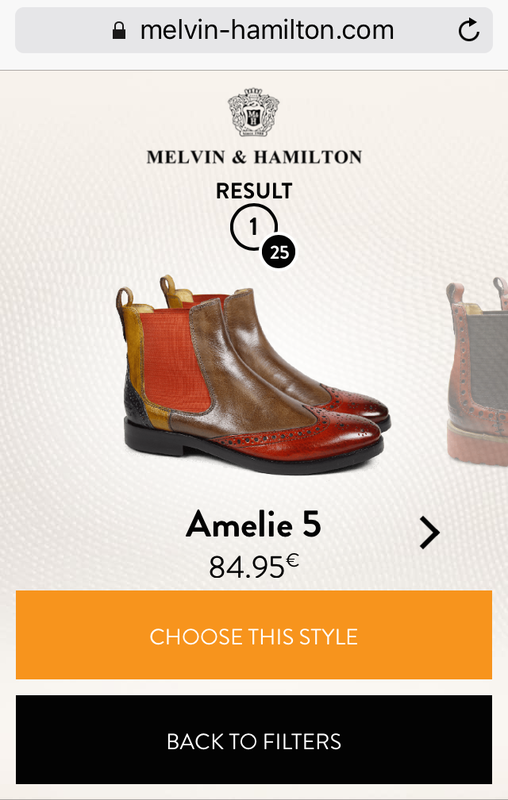 Can I order Melvin & Hamilton shoes via my smartphone? – Answers to all your questions in our client center. Of course you can! Our website is also accessible from your smartphone. We adapted the website so that you can discover our models and order your favorite shoes! Use now our special feature, only available on smartphones. Discover and select a pair that matches perfectly with your mood! You have access to this feature when you load our website on your smartphone browser, as shown above. Click on "Start the experience!" Simply choose between the two options that appear on the screen until you reach the list of products that matches your search criteria. Models for men, women, colorful, sober, with laces, rubber or leather sole, open or closed ... You will have a quickly and easy access to the styles in our official store that suits you the best! Then simply browse the list of models applying your criteria and add them to your cart by selecting your size after clicking on "choose this style." Click on "back to filters" to repeat the experience with other criteria and find your new favorites in no time!